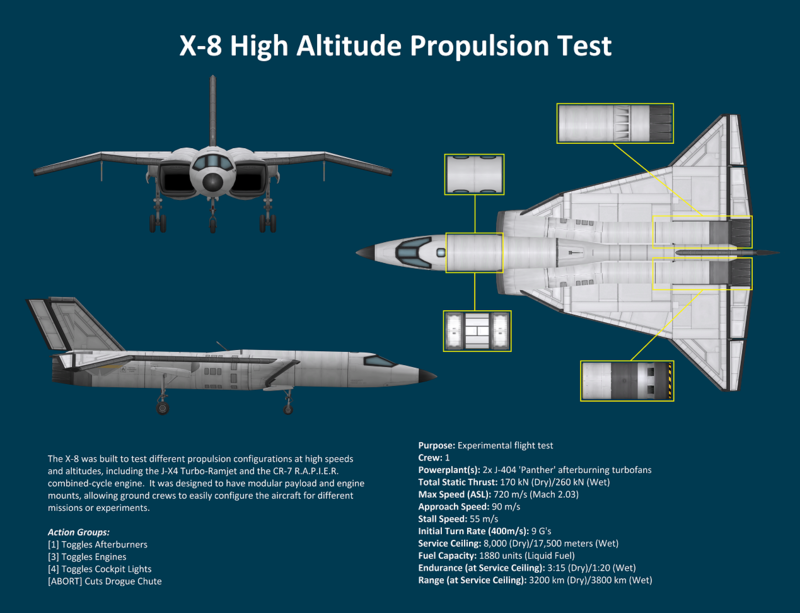 The X-8 was built to test different propulsion configurations at high speeds and altitudes, including the J-X4 Turbo-Ramjet and the CR-7 R.A.P.I.E.R. combined-cycle engine. It was designed to have modular payload and engine mounts, allowing ground crews to easily configure the aircraft for different missions or experiments. NOTE: I purposely avoided mounting any parts to the yellow-highlighted areas of this craft. This allows very quick part swaps for different payloads or engine/fuel tank combinations. When changing out components, be mindful of where the Center-of-Mass is in relation to the main landing gear. You may need to slide the main landing gear forward or back to maintain proper relative positioning.